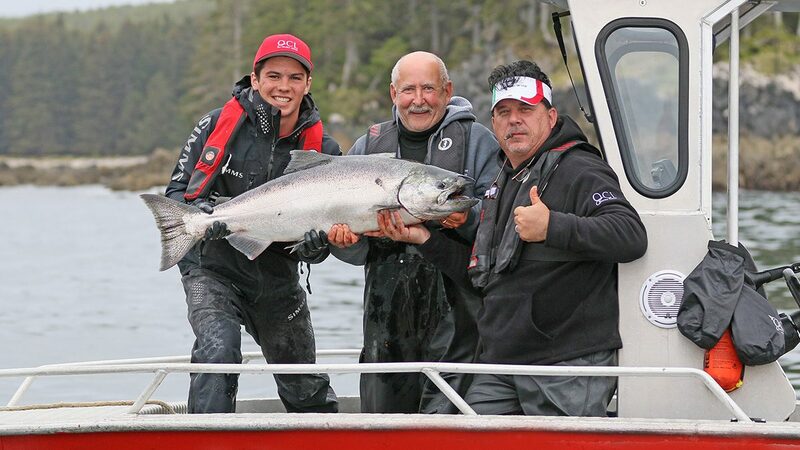 Up here in Haida Gwaii we’re fortunate to have such a long productive fishing season. While the makeup of the fishery changes as the weeks go by, we generally have pretty consistent action in comparison to most other locations. We refer to these waters as the gateway from the open North Pacific through which pass so many different runs of salmon on the return journey to their natal streams. Potentially every day we see salmon on their way to different river systems and the differences in strains can be noticeable. These days, in the early season, we commonly see lots of “feeder Springs” – powerful fighters and aggressive feeders, they’re generally in the 12-18 pound class. But it’s rarely just one run coming through at a time. This weekend we noticed an increase in the number of fish in the low twenties and we’re getting the odd Tyee (over 30) as well. And to top it off, really huge salmon can pass by anytime. In 26 years we’ve literally caught a 50+ pound salmon during every trip of the season. Every day we head out on the water we’re eager to discover just who’s swimming our way! With access to so many runs, we never know. That’s just another part of what makes fishing so exciting! While most anglers manage to get their fill of salmon it was the bottom fishing that garnered all the recognition this weekend. Several nice halibut and lingcod showed up at the dock and the Bell Ringer was rockin’ every night. Quite a few halibut in the 30-50 pound size were taken and notable releases were a 77 pounder for Andrew M, a 90 for Curtis L and a 121 pound prize for Remo T. The big halibut this week scored 148 lb and Aubrey C was the successful angler, receiving her gold halibut pin and a place on the QCL Halibut Club board along with Remo. Lingcod are a popular catch for QCL anglers as well and we saw some wonderful 20-pound-plus fish at the scale on the weekend with the largest being a 32 for Anita A. Well done! 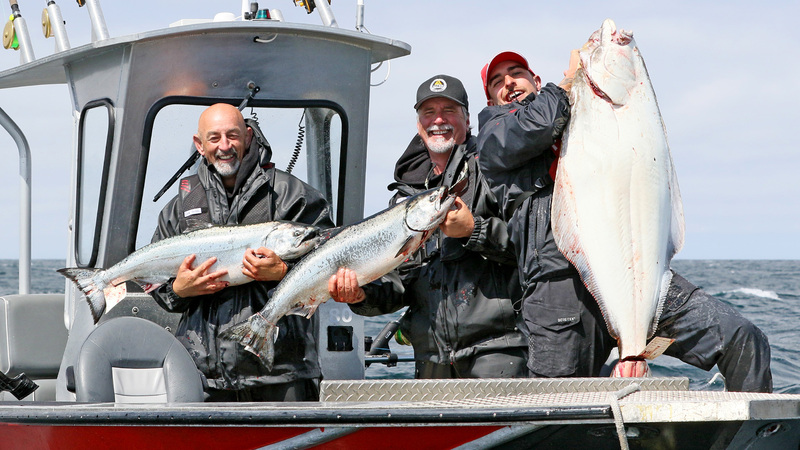 We enjoy hosting derbies for many of our groups and this weekend saw the top salmon prize for the Annual Legends Cup go to Ken K for his stunning 33-pound Tyee, caught while fishing with guide Isaiah Dahl. Congratulations Ken! Looking at the week ahead we’ve got a mixed bag of weather in the forecast, winds west to south to southeast to east and back to west by Friday. Tides are moderate with swings of 7-12 feet.